Work­shop for Con­struc­tion Inc. (WFORC) is a con­struc­tion com­pany that is devoted to building archi­tec­turally unique and tech­ni­cally com­plex designs at the scale of ren­o­va­tions and new con­struc­tion. 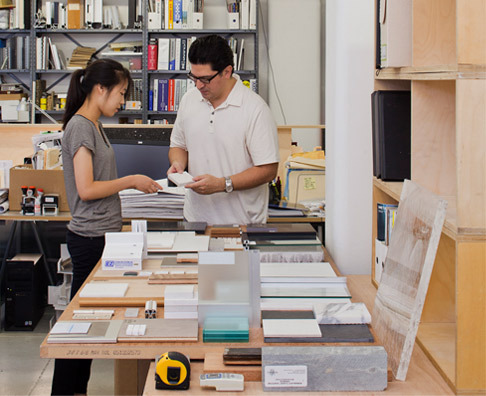 WFORC grew out of the suc­cess and expe­ri­ence of Work­shop for Archi­tec­ture LLP (WFORA), an award-winning archi­tec­tural firm based in New York City. Seeing first hand the prob­lem­atic gap between archi­tec­ture and con­struc­tion in our building cul­ture, we are trying to make the process of designing and building better. Together and indi­vid­u­ally, the people within our com­pa­nies believe in an approach that values great design, and its con­struc­tion with intel­li­gence and rigor. 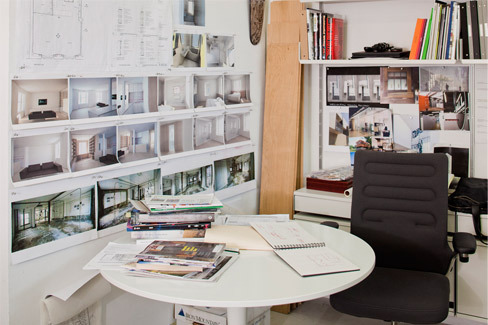 In each con­struc­tion project, we aim to build the client’s design with care and respect through tightly man­aging and sup­porting our team of tradesmen. We believe con­struc­tion is not just bricks, mortar and money but more impor­tantly people and com­mu­ni­ca­tion. We stress the impor­tance of the right people knowing the right infor­ma­tion at the right time. This is the essen­tial ingre­dient that helps us manage all the demands of cre­ating beau­ti­fully designed spaces. As an orga­ni­za­tion com­prised of archi­tects, con­struc­tion man­agers and skilled tradesmen, WFORC brings together a unique team that infor­ma­tively unites design and building. Every project is staffed with the archi­tec­tural designer who devel­oped the project as well as a con­struc­tion project man­ager. From the early design phases, both team mem­bers dis­cuss the demands and para­me­ters of the project, from aes­thetic details to overall exe­cu­tion. By doing this, mis­com­mu­ni­ca­tion that often occurs between archi­tects and con­trac­tors in a tra­di­tional bid-build approach is avoided from the begin­ning. 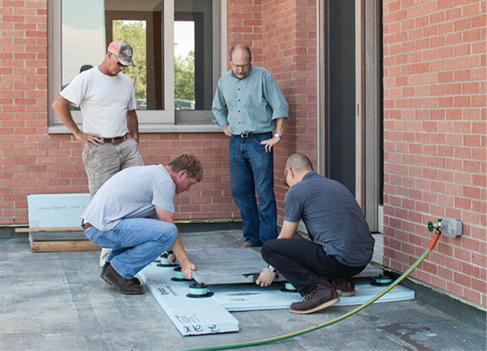 This early ini­tia­tive towards useful infor­ma­tion flow reduces the amount of time wasted and mis­takes made during construction. Bud­gets are in the fore­ground and back­ground of every dis­cus­sion of a con­struc­tion project. 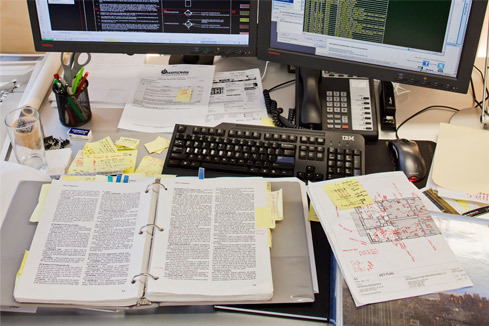 To ensure everyone on our team under­stands the rela­tion­ship of design to dol­lars, the archi­tec­tural team works with the con­struc­tion man­agers to under­stand not only the cost impli­ca­tions of spe­cific design inten­tions but also how those values are deter­mined. As our designers better under­stand the dri­vers of cost, they can manip­u­late designs strate­gi­cally to pre­serve design while addressing budget issues. For us, “value engi­neering” is not the end to a well designed project but rather a moment to apply this holistic knowledge. Many approaches exist in the con­struc­tion industry for estab­lishing profits and fees for the gen­eral con­tractor including the tra­di­tional ‘stip­u­lated sum’. We prefer to sim­plify this con­di­tion by using an ‘open book’ accounting system in which all sub­con­tracts and product bids are revealed to the client under a ‘cost plus fee’ con­tract. In this approach, we present more than one sub­con­tractor bid for a spe­cific trade, and make rec­om­men­da­tions to the owner based on cost, ref­er­ences, avail­ability, and quality of work­man­ship. After the owner approves a bidder, our profits and oper­ating costs are then added to the bid as a simple fixed per­centage. In this approach, the owner under­stands the ratio­nale behind the selec­tion and the expec­ta­tions of a spe­cific sub­con­tractor or supplier. One of the key ele­ments in deter­mining the suc­cess of a project is the effi­cient sched­uling of con­struc­tion work. We imple­ment three key sched­uling bench­marks with all sub­con­trac­tors: Pre-Award Time­line, Pre-Start Time­line and Daily Work Time­line. We become part of the man­age­ment team to mon­itor and main­tain project effi­ciency. We require all sub­con­trac­tors to fully describe the inner-workings of their com­pany, as well as their sources for sup­plies and delivery. Through these types of dis­cus­sions we are better able to adhere to sched­ules and uncover unre­al­istic time­lines pro­vided by sub­con­trac­tors and suppliers. While our senior staff mem­bers run all daily activ­i­ties, we encourage our younger employees to spend time on-site, whether they are involved in that spe­cific project or not. WFORC and WFORA believe the con­nec­tion between studio expe­ri­ence and on-site expe­ri­ence is a crit­ical part of making mean­ingful archi­tec­ture. Too often this rela­tion­ship is dis­con­nected as one side tends to over­sim­plify the impor­tance of the other. Even though tech­nology and the internet allow our people to better find and use infor­ma­tion, this is all sim­u­la­tion. For our pur­poses, there is nothing more infor­ma­tive than walking through a con­struc­tion site and absorbing the incred­ibly com­plex dynamics of con­structing a design from scratch. Fac­tors like weather, momentum, drying time, trade coor­di­na­tion, etc. cannot be under­stood in absentia. By exposing our younger staff to these ele­ments, we are nur­turing a more thor­ough team of professionals. A grad­uate of the Har­vard Uni­ver­sity GSD, John has worked for sev­eral respected firms including Pei, Cobb, Freed & Part­ners (aka, Pei Part­ner­ship) and KPF & Asso­ciates. Even­tu­ally he became a Partner at HLW Int where he super­vised the design direc­tion of the Finan­cial & Devel­opers Studio. There, he led the design of projects including the Schering-Plough Cor­po­rate Head­quar­ters, Bloomberg Office Head­quar­ters and Novartis Phar­ma­ceu­ti­cals Campus all in New Jersey. He also worked closely with Mack-Cali Realty, SJP Prop­er­ties and other devel­opers designing var­ious com­mer­cial com­plexes. John also worked inter­na­tion­ally designing office towers in Shanghai, China for the Ciros Cor­po­ra­tion and in Seoul, South Korea for the LG Group Corporation. In 2003, having left his cor­po­rate posi­tion, John estab­lished his own prac­tice, Work­shop for Archi­tec­ture, with the MIG Offices project. In 2008, the project was awarded a Design Merit by the AIA New York Chapter. 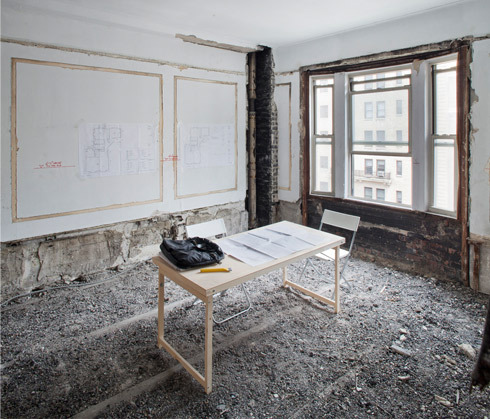 Since then, his office has been steadily com­pleting projects of varying sizes and types both in NYC and abroad. 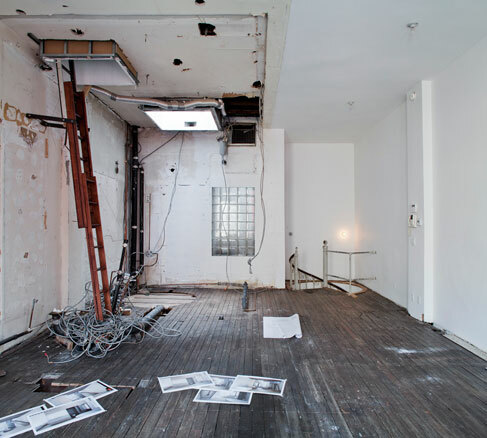 In 2008, to extend his prac­tice and pursue his growing interest in the building process as an inte­gral part of archi­tec­ture, John estab­lished Work­shop for Con­struc­tion. Cur­rently, the two enti­ties work together to create a wholistic approach to designing and building. John was served as a Vis­iting Instructor at Pratt Institute’s School of Design in the Inte­rior Design depart­ment and has lec­tured at the SUNY School of Archi­tec­ture. He has served on design juries at sev­eral archi­tec­tural school including Uni­ver­sity of Penn­syl­vania, Columbia Uni­ver­sity and Cor­nell Uni­ver­sity. He was a fellow at the Mac­Dowell Colony in 2010.